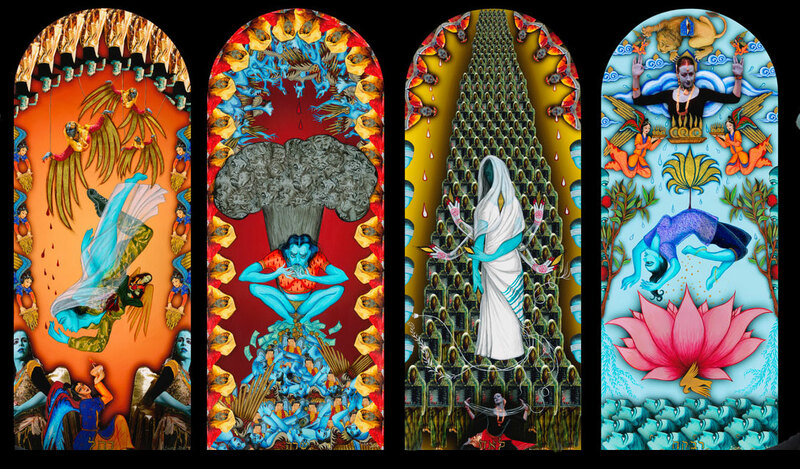 Siona Benjamin is an Indian Jewish artist whose works blends the influences of illuminated manuscripts, Indian and Persian miniature painting, Byzantine icons, Indian comics, Bollywood, and pop art. Raised in the Bene Israel community in Mumbai, educated in Catholic and Zoroastrian schools, and now living in the United States, her vivid paintings—usually in gouache—evince all of these influences. The artist describes herself as “100 percent Jewish and 100 percent Asian,” a combination she often needs to explain, but one that is also an important engine for her prolific and energetically experimental work. 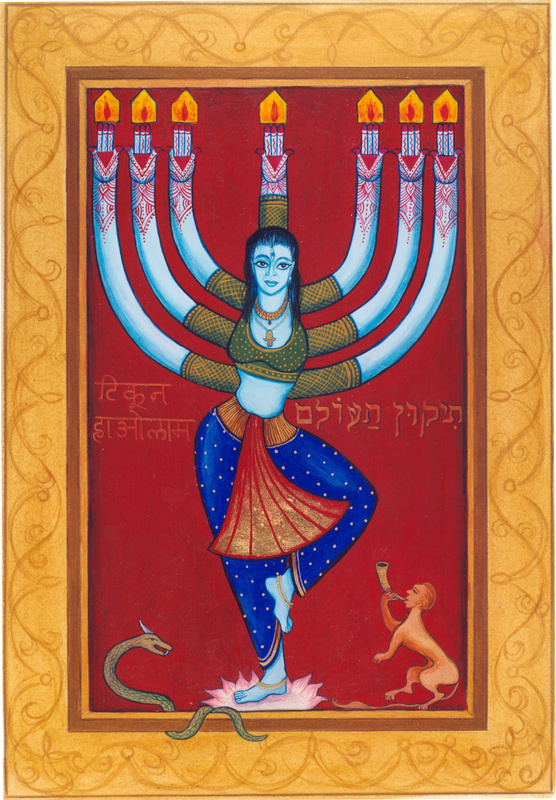 In one of her more famous paintings, Tikkun HaOlam (#46 in her Finding Home series), a pale blue female figure, a portrait of the artist herself, balances on a lotus flower and extends seven arms upward like a Hindu goddess. On closer examination, we can see that her hennaed hands are topped with flames; she is not a goddess, but a menorah. In its mixing of religious iconography, this painting has been compared to Chagall’s White Crucifixion, which portrays Jesus on the cross with a tallit loincloth. Benjamin’s seven-armed woman is bedecked with more cross-cultural symbols, a third eye on her forehead and a hamsa around her neck. The flames are shaped like tiny houses. A more recent painting grew out of Benjamin’s study of midrash. In Four Mothers Who Entered Pardes, she reinterprets the famous talmudic tale (Chagigah, 14b) of four rabbis who entered an orchard, a metaphor for ecstatic mystical practice. The experience is so dangerous that one of the rabbis dies, one goes insane, and one becomes a heretic. Only Rabbi Akiva escapes the pardes unscathed. Benjamin casts the four matriarchs in the roles of those rabbis. From left to right, Rachel is the one who dies—in childbirth. Her death is represented by a swan dive amidst weeping angels. Sarah, Benjamin imagines, went insane after Abraham nearly sacrificed Isaac. She squats in front of an atomic mushroom cloud of demonic faces, devouring and excreting money. Leah is cast as the heretic, her face hidden behind a veil, having lost faith because she never won her husband’s love. Leah’s weak vision is represented by two columns of blindfolded faces, the fire from her fingertips alludes to the tribes emanating from her, and the field behind her recalls the unusual expression the Talmud uses in this context: “cut shoots.” It is Rebecca, the matriarch who courageously took control of her offspring’s destiny, who is pictured ascending and descending unharmed. Her frame contains lotus flowers (a symbol of rebirth), a lion of Judah, and many tiny houses—one of which contains an eye shaped like a flame. Rachel Scheinerman is the web editor for the Jewish Review of Books. I love the second piece especially, but as a quibble with the review, it it does not take closer examination to figure out that the Hindu goddess is a m'nora. In 1934, Hollywood's Jewish moguls met secretly at the Hillcrest Country Club to hear an unusual pitch. A former ADL official was running a network of World War I veterans who had infiltrated the local Nazi organization. The intelligence was alarming, and he needed funding. In 1971, 41 percent of American Jews were part of the Conservative movement. Today it's 18 percent and falling fast. What happened? Maybe its leaders never knew what Conservative Judaism was really about.